I have been telling my mom about white bass for years. Every time we would try to go after them the odds were stacked against us. It was either the weather, water conditions or schedule conflicts. Something always seemed to deter her from catching the white bass while they were running. This year I had been diligently watching the weather. My past years of experience with weather patterns and previous bass runs helped me deduce the perfect day. This time there could be no excuses. It was a warm bluebird sunny day and the water was slowly dropping and starting to clear from recent storms. Prime conditions. We arrived to the river later than I liked. Several cars were already in the parking lot which made me antsy to get to the water. I hurried along the trail peering over the edge and seeing anglers camping in various spots that were productive in previous years. The banks were muddy and you had to take great caution with how you navigated the terrain. I think that's what I love about the white bass run. Getting to the river is part of the fun. You have to log hop, parry your way through large briar bushes and deal with slippery mud. The leaves hadn't fully sprouted on the trees yet and you could really see the features of the river. We fished the banks and the goal was to figure out the retrieve. It seems ever year the white bass want something different. Sometimes it's a couple twitches, other times it's stripping really fast or doing nothing. Today it was just letting the fly drag and swing in the current. The strikes were obvious, you can feel the line move and actually see it jerk. The usual scenario was cast near the bank the fly line would belly then as the fly swung tick tick boom. Fish on! It took a few tries but my mom was successful in catching her first white bass. She caught plenty more after that and we had several doubles. Many of the fish were small males but every now and then you'd get a hefty female. The kreelex flies I tied seemed to be doing the trick. I still think white bass are some of the most fun fish to target with a fly rod. The larger fish fight so well you never know what you have until you get the fish in close. A large female can strip off line and run circles around you before allowing you to land her. It never gets old. The best part of the day was that I could enjoy it with my mother. I hope this if the first of many white bass runs we can fish together. I got out Saturday and tried my luck with some educated trout. 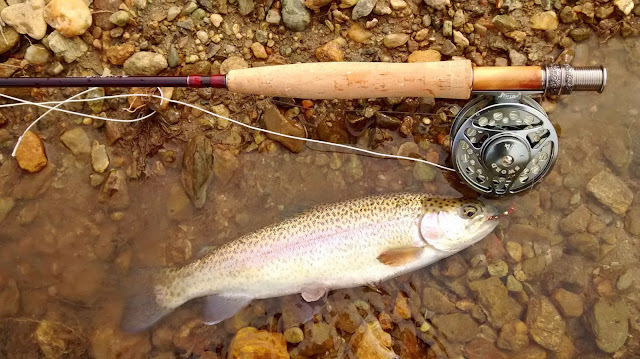 The fish don't hit the usual flies like egg patterns, San Juan worms and big bead head flies. It's times like these when the best fly is usually something out of the norm. 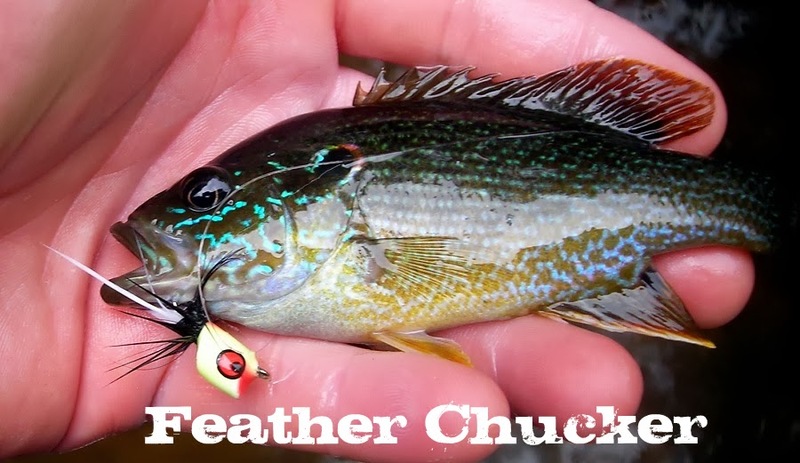 A fly that you wouldn't normally throw for trout. 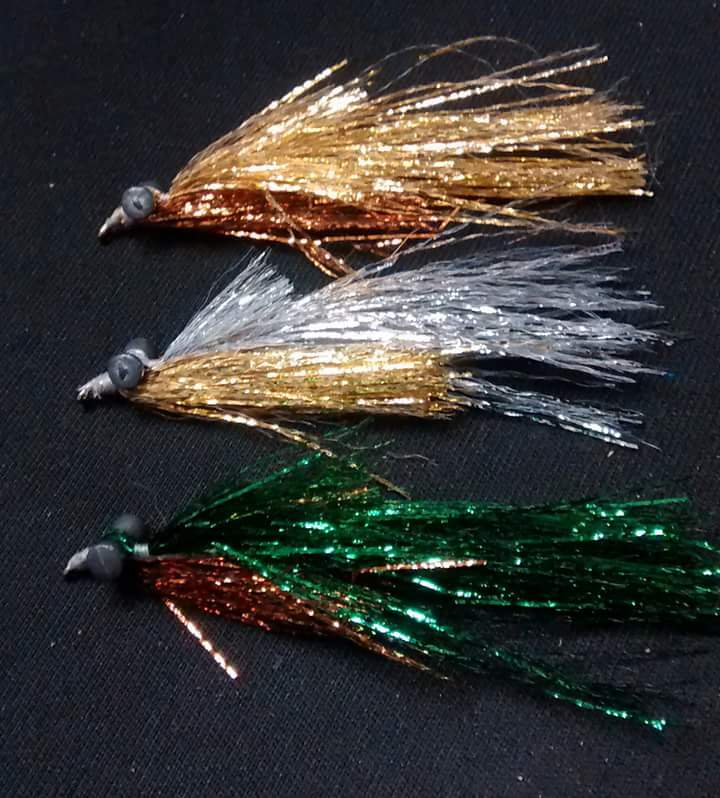 I went with a copper and green kreelex fly. I was getting many misses that I could tell were reaction strikes. Eventually I caught a few. I'm really enjoying this Anglers Roost and Piscifun Reel setup. The rod handles well whether I'm nymphing or throwing streamers. A good 14" fish will give you quite a tussle on the 3/4wt. There were a few fish that stripped line several times and I didn't have the upper hand where I could move them wherever I wanted. It makes catching the larger fish much more fun and challenging. I worked on my nymphing with the new 3wt Anglers Roost Rod. It performed perfectly and I had a really great day. One of the best movies I've seen in awhile.